So - I was out of town this weekend for a jazz festival (along with my advanced vocal jazz ensemble) and I knew that my Stitch Fix box would be waiting for me when I got back. How excited was I about that??? VERY! It's always fun to get a new fix! 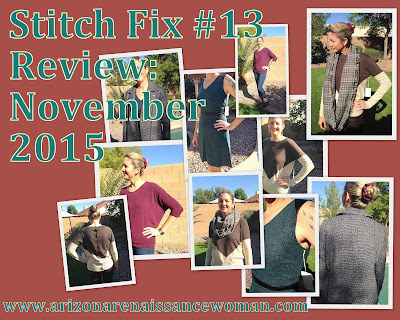 I've never been much of a shopper, but the longer I use Stitch Fix, the more I learn about fashion! During my trip, I had a great time shopping in some cute little boutique stores. We had a little bit of downtime, and I discovered that our pianist (new this semester) was a great shopping partner! It was fun getting to know her and exploring some interesting shops! The festival that we attended was in San Luis Obispo, CA. We ended up staying in the cute coastal town of Morro Bay. Morro Bay had a fun, eclectic assortment of shops, restaurants, and other attractions. Well, to make a long story short, I bought two cardigans and a pair of crazy-looking, colorful boots! They caught my eye right away - they were either the cutest or the ugliest boots I had ever seen. I decided to go with cutest, and I splurged! After I tried it on, my mind didn't change. It's OK, but it didn't stand out to me as something particularly flattering. The fit was right on, but I just didn't have a great reason to keep it. I was underwhelmed. Wow - I look pretty serious about that scarf, huh? Ha ha. I wasn't really crazy about the pattern and colors of this scarf, either. I have not jumped on the fall plaid bandwagon yet. To me, plaid is just OK. I don't hate it. I definitely don't love it. A bright blue plaid might convince me . . . maybe. This plaid was rusty orange and hunter green. I might dig it if I had other things in my closet that would match it. I don't. I'm more of a primary color or jewel-tone kind of woman. I thought about updating my style profile to show that I do not want to receive scarves, but that's really not true. A blue scarf with polka dots? A leopard scarf? Sure - I'll try those! I could have kept this one, but I think my sister will get much more wear out of it than me! I love the bright burgundy color. The style and cut, though? Not really. I'm just not into it. It's a little too long for the style, a little baggy, and not flattering enough to justify keeping it. It does match with my crazy boots, though. Check them out - ha ha! There's not much else to say about this sweater. It's OK. Since I seem to have an abundance of clothing at the moment, I'm going to pass! I was sad about this dress. Out of everything in the box, I thought this was the closest to my style! I loved the teal color. It even matched my tattoo perfectly - see? It just didn't fit. It was too tight. I was able to get it on and zip it up, but it was very uncomfortable and tight around the middle. The funny thing was that it fit in the shoulders. That's usually my problem area . . . Sigh. Look at the cute faux leather detail at the shoulders and waistline. This jacket was a good idea. It is my style. I like the color and all the zipper detail. There were a couple of things that were strange about it, though. The fit wasn't quite right. It was a little baggy/puffy in the underarm area. It's hard to see in this picture, but it just seemed like there was some extra fabric there. Also, the arms were a bit tight and had no stretch to them at all. It looked alright, but wasn't comfortable. I don't think I could have worn it over a sweater. I just didn't see myself wearing it very often. I'm starting to realize that if I don't love something, I should pass! Too many clothes! So, this fix turned out to be kind of a miss. That's OK. It's really OK. I've kept all five items from my last two fixes, so I was due! I've also gotten a lot of clothes within the last few weeks, so I don't NEED anything. This is really just for fun! My stylist, Melanie, has sent me some awesome items in my last few fixes that I love and wear regularly! (I wore that grey cardigan from my last fix all weekend in Morro Bay!) I hope she can style for me again! I have updated my style profile to indicate that I don't love plaid and some of the "in" fall colors, such as olive. I think I needed to make some of my preferences more specific. That colorblock sweater in black and blue? I would have been all over it! Thanks, Sheena! I just checked out your blog and really enjoyed reading your review. Also - Bombfell . . . ??? That's a new one for me. I'm going to have to check that out. AWESOME! But...but... but... the dolman looked fantastic on you! The dress was super cute too. Too bad about the fit. I've seen that sweater in other colors and thought it was cute, but the brown, not so much. This is the first fix of yours that made me scratch my head. Usually, everything looks spot on for you, but this time, it's just a bit off.